Yes, we said it: Paper can be considered part of your data backup strategy for small files or data sets. This article could very well end up being one of the strangest tech articles that you’ve read in quite some time. Even so, the idea is something that I’ve been thinking about for a while, and I finally decided to write about it: paper backup. Those of us who work in IT are all familiar with the importance of performing regular data backups. Restoring a backup is often the only way to get your data back following a catastrophic event. Historically, though, data backups have been written to electronic media such as tape, disk or even optical drives. But is it possible to back up your data to paper? I’m not talking about printing out a copy of your company’s annual budget report so that some poor soul in turn can retype it in the event that the file is ever damaged. I’m talking about backing up actual binary data to paper. As far as I know, no one has ever done this before, but, believe it or not, the idea does seem to be feasible (at least for small files or datasets). If you are going to back data up to paper, the first thing that you will need is some way to encode the data. This can be accomplished in a variety of different ways. Even a simple bar code is a machine-readable mechanism for encoding data on paper. If we are talking about writing larger quantities of data to paper, though, then a bar code is not going to cut it. A higher-capacity encoding mechanism is necessary. A QR code might be a good fit. This, of course, raises the question of how much data can be encoded into a QR code. Believe it or not, the answer is not as straightforward as you might assume. There are several different sizes of QR codes, with larger codes being able to accommodate more data than smaller ones. It isn’t just the size of the QR code that matters. The degree of error correction being used makes a difference, as does the data type. QR codes can be designed to store numeric, alphanumeric or binary data. A binary QR code would be required for performing a data backup, but, unfortunately, a QR code that supports binary data cannot store quite as many “characters” as a QR code that stores only numeric data. The chart here illustrates this concept. 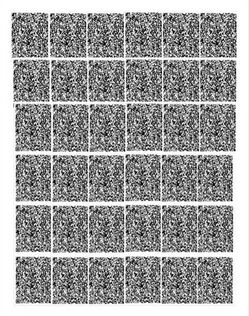 A 177 x 177 QR code can store 3K of data (although the binary data is limited to 2953 8-bit characters). There are exotic coding schemes that can store greater quantities of data, but let’s just go with this since QR codes are an industry standard and we will assume that a code can store an even 3K of data just to keep the math easy. So, obviously, a QR code with a 3K capacity isn’t going to be able to store anything meaningful. But what if you could span the data set across multiple QR codes? The question would then become a matter of how large each code needs to be printed. Guidelines for printing QR codes vary, but Unitag recommends a minimum size of 3 cm or 1.2 inches. 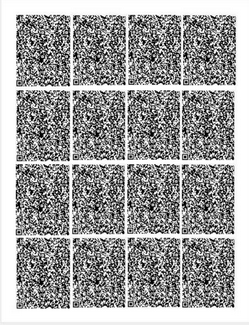 When printed at a size of 2 square inches each, I was able to fit 16 QR codes on each page (while respecting the page margins), as shown in Figure 1. That would yield about 48 KB of data storage per page. If I were to go with the minimum code size of 1.2 inches, then I could cram codes onto a sheet of paper for a maximum storage volume of 108 KB per sheet. You can see what that looks like in Figure 2. I seriously doubt that paper will ever become the hot new backup medium. Although performing data backups to paper does seem to be feasible, it’s probably not the fastest or most practical way to perform a data backup--never mind the capacity limitations. Not factoring in for overhead, it would take over 10 million pages to store a terabyte of data in this way. Even using some of the more exotic encoding schemes, the limit seems to be about 2 MB per page. Even then, it would still require over half a million printed pages to store a terabyte of data. Regardless, I find it fascinating that paper, which is existed in one form or another for thousands of years, is able to store electronic data.